How I Doubled My Google AdSense Earnings by Making a SMALL Change without Adding New Content! As you can see, my yesterday's earnings jumped 230.4%. If this keeps up for the entire month, then my monthly revenue will more than double. So what did I do to double my Google AdSense earnings? Did I have to add any new content or renovate my website's look and feel? NOT AT ALL. Read on to find out more. Let's look at Google AdSense report. First I go the Performance reports tab of my Google AdSense account at https://www.google.com/adsense/app. I want to find out which of the ads I placed on my website are generating the highest revenue. So I select Custom channels in the drop down menu next to Report type >. You can select a period of time that give you enough data. If your website has a little traffic, you may need to select a month-long report. If your website has a lot of traffic, one week may be enough. Chtoen-300x600's impression count is so little compared to Chtoen-500x64's impression count, but Chtoen-300x600's RPM is so much higher. RPM stands for revenue per thousand impressions. So impression count / 1000 x RPM = earnings. So an obvious way to increase earnings is by increasing the impression count of "Chtoen-300x600". I realized that the reason this ad has so few impressions is because this ad was only showing when a visitor landed on my website's homepage. I simply made a change to show this ad on every page of my website. 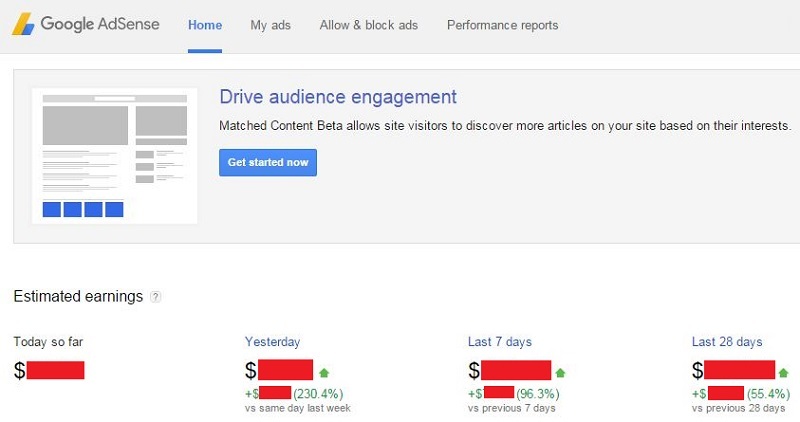 By making this little change, my Google AdSense earnings more than doubled. Hope this article will help you analyze your own website's ad performance and be able to spot quick ways to increase your Google AdSense earnings. A little change goes a long way.